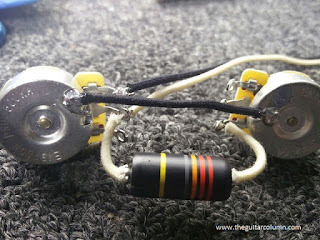 Our guitar wiring expert friend, Arnold, has always been a fan of Les Paul Juniors. And while browsing the net recently, he came across a seller offering a double cutaway Junior-style neck and body for a little over 300 bucks. Taking the plunge, the beautiful raw wood kit that arrived featured an Indian rosewood fingerboard, mahogany neck, and a one piece mahogany body. 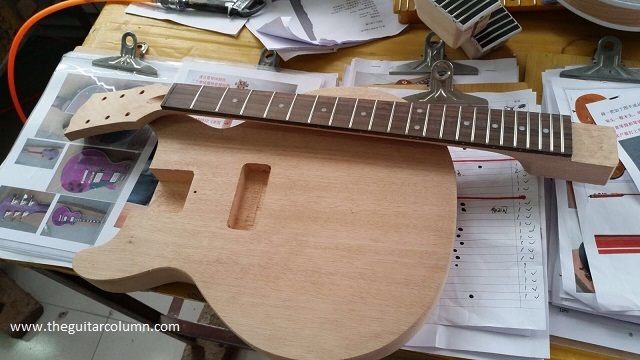 Our luthier buddy, Luca Quacquarella, was tasked with assembly, painting and final setup. Arnold chose to not have the mounting stud holes for the bridge drilled. The kit maker would only provide metric sized screw holes whereas Arnold wanted to use a compensated MojoAxe bridge that came with Imperial sized studs. Ah, the age old Imperial versus metric quandary. 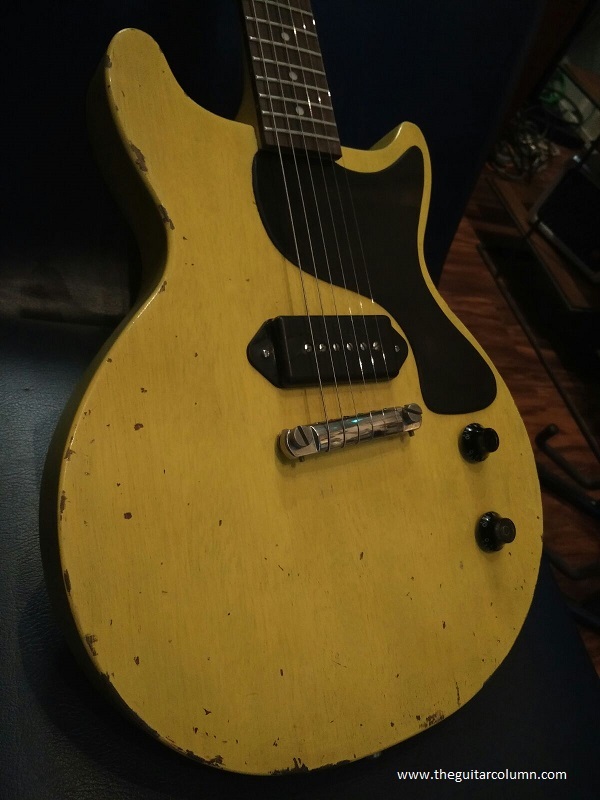 Originally issued in 1954, the Les Paul Junior was Gibson's foray into the budget and student market. Featuring slab mahogany bodies and very simple electronics in the form of a single P90 bridge pickup and basic volume and tone controls, the Junior eschewed all accoutrements of its more expensive Les Paul solidbody cousins. No carved maple tops, binding, or fancy inlays for this little guy! While the very first Les Paul Juniors were single cutaway instruments finished in a brown sunburst, Gibson later made available a TV Yellow finish model in 1955. In the days of black and white television, white guitars tended to 'wash out', appearing overly bright on-screen. The TV Yellow finish made the guitar appear a more natural white. 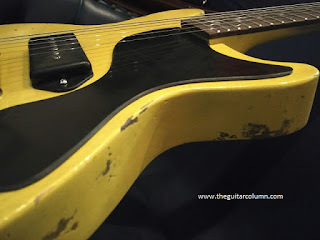 The double cutaway Junior, like Arnold's kit, was released in 1958 in response to player's requests for more access to the upper frets. A little bit of play was evident in the neck to body joint when the kit arrived -- they could have cut it more precisely for a snug fit. 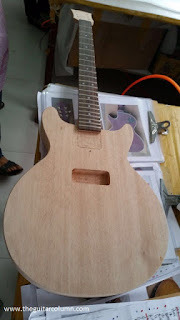 After gluing the neck to the body, Luca proceeded with applying a light dark stain to bring out the grain of the wood a little more under the final paint. 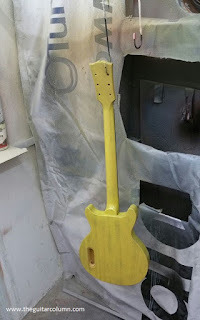 Three coats of nitrocellulose lacquer, closely matching Gibson's original TV Yellow, were then applied, with the paint allowed to dry thoroughly between coats. On the black painted headstock face, Arnold chose to go with a smaller, stylized Luca Custom Guitars logo for simplicity. In the spirit of the original Les Paul Juniors, Kluson button vintage-style tuners were chosen, along with a black, single-ply pickguard. Luca also installed a bone nut he cut and polished from scratch. Next came the tricky task of drilling the screw holes for the bridge studs. 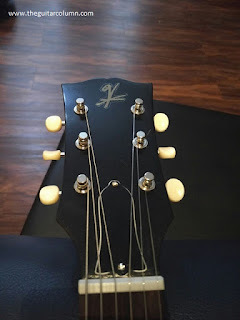 Because the Junior used a simple stopbar tailpiece that functioned as a bridge, the measurement had to be very precise as there are no individual saddle screws for intonation adjustment. The MojoAxe stopbar bridge is compensated for better intonation by way of subtle ridges molded into the top, but its placement is still crucial nonetheless. Instead of measuring from nut to bridge, Arnold suggested attaching a high E and a low E string to an anchor point on the workbench. Sliding the bridge along the body and checking with a strobe tuner until intonation was achieved, the stud holes were then drilled and the bridge mounted. No room for error here! 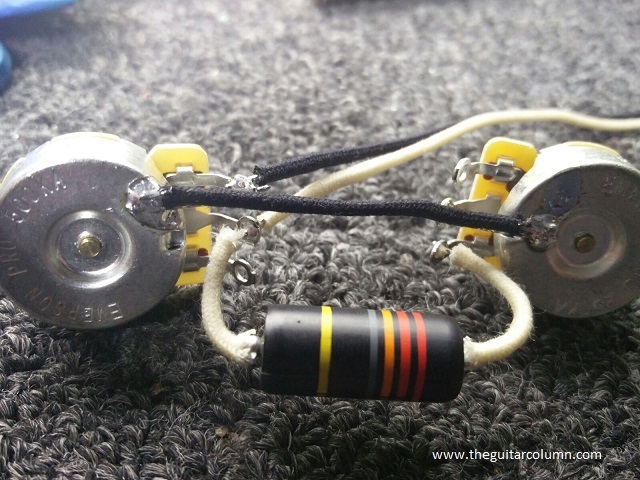 At Luca's suggestion, a hot wound Porter P90 pickup was chosen, with Arnold supplying his own wiring harness for the electronics -- Emerson pots, in values of 500k for the volume control and 250k for the tone, with a .022uF paper-in-oil capacitor. Apparently, pot values of 500k for volume and 250k for tone are the magic numbers for P90 equipped guitars. 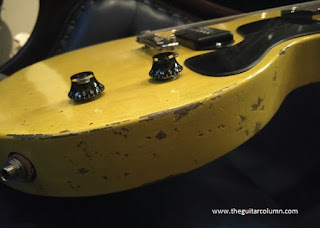 To give it that lived-in, played for decades look, Luca gave the guitar a tasteful relic finish. So many guitar manufacturers these days use templates to map out wear spots and dings on new guitars. It saves a lot of time, but one can't help feeling a little cheated that almost no thought went into relic'ing the instrument. Not to mention that you would have guitars with about the same wear spots in the same places. Luca still does it the old fashioned way -- artistically and with much deliberation for where a guitar might receive its dings, scrapes and wear spots after years of gigging. And damn, does this thing look like a real Les Paul Junior from the 50's!